Story-driven exhibits — In the virtual analogue to a physical museum, visitors are drawn through a story, guided through sections and subsections, filled with text and multimedia. These can be costly to produce if they have a lot of pages or extensive multimedia, but are inexpensive on the simpler end (as the student exhibits show). A decade ago, there was a boom in richly multimedia virtual exhibits as museums and publishers rushed to make virtual exhibits. That boom quickly tapered off, as sky-high develop costs did not lead to revenue, and virtual exhibits are now produced less often. The virtual exhibits at WebExhibits are mostly story-driven. 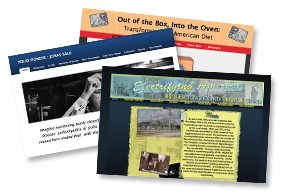 Students have been making web sites for National History Day and other annual contests like ThinkQuest since 1996. Kids do this in their after school time. Student projects avoid adult intervention, and so they suffer from typos, misdirected emphasis, awkward layouts, and limited research. But these flaws could all be easily remedied in a non-contest setting, if students were supervised by a historian or curator, and perhaps a design mentor. If cheap, imperfect exhibits can be made by kids, there has to be a lesson for the establishment. But what’s the lesson? Should museums have summer internships with teams of kids? Should they partner with existing youth outreach projects? Or should they make more short & sweet virtual exhibits, which will not get bogged down with complex contracts, tedious planning and budget creep? If museums don’t increase their investment in virtual exhibits, there is evidence that others will step up to the plate. Software companies are moving into this space. For example, see our recent post about “The virtual vs. the real: Giga-resolution in Google Art Project” where Google collected deliciously high-resolution photos, metadata, and interesting captions, to create a new kind of online art exhibit. And in the sciences, our blog post “Making of science apps: Not the usual suspects” talks about how eBook publisher TouchPress has created two interactive eBooks, on the periodic table and about the solar system, which are effectively hand-held virtual exhibits.